The Ipoly river and northern edge of Ipolypasztoi. The Soviets would come in from the road to the right (north) and the Germans were in the town. 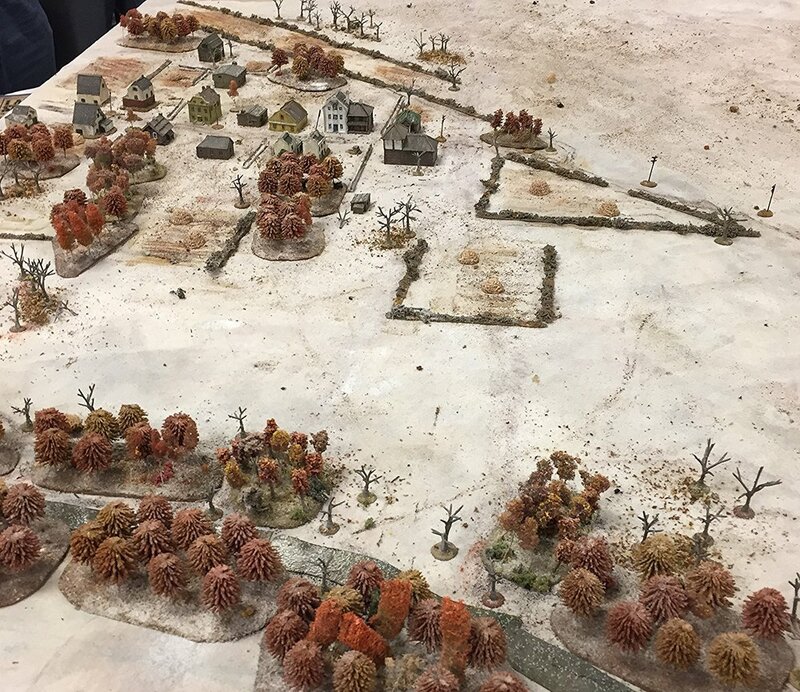 This scenario takes place on the north side of the Danube during a three week battle launched by the Soviets to cut the left flank of the units trying to relieve Budapest during Operation Konrad. Weather during this game was -5 C and the area was covered in light snow. William and John F. were the German players, and they had units from the 3rd Panzer Division: three Jagpanzer IVs from Panzer Abteilung 543, a weakened company of grenadiers (three zug of two sections each), two panzerschrek teams, two MMG sections, and two off board 82mm mortars. They also had a group of pioneers from Pioneer Abteilung 39. 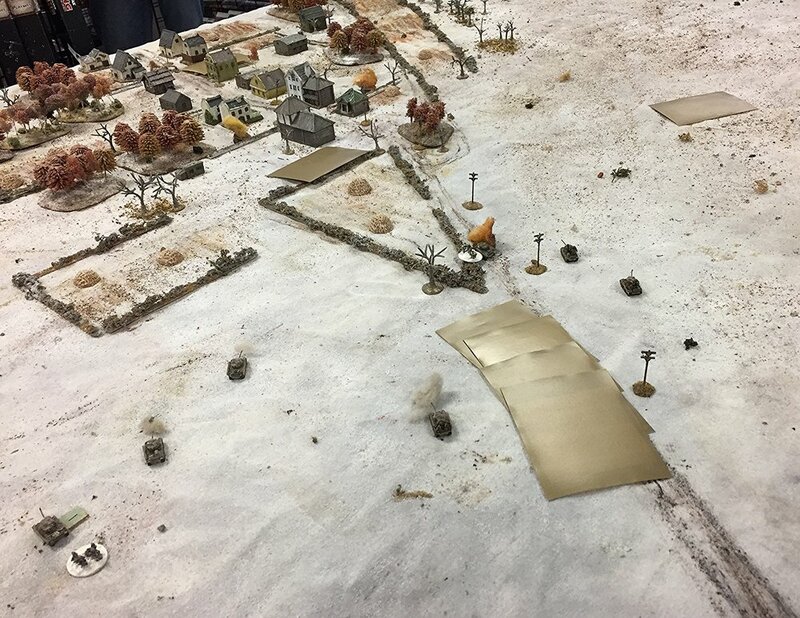 They were allowed to lay some mines and then had to get out without taking any casualties. All units could be dug in at the start. It was possible that some Me 210ca from the Hungarian 102 Rapid Bomber group might make an appearance. Matt G and I were the Russians. Matt had the armour and tank riders from the 46th Guards Tank Brigade. Seven M4A2 Shermans with 76mm guns and three sections of SMG-armed tank riders. 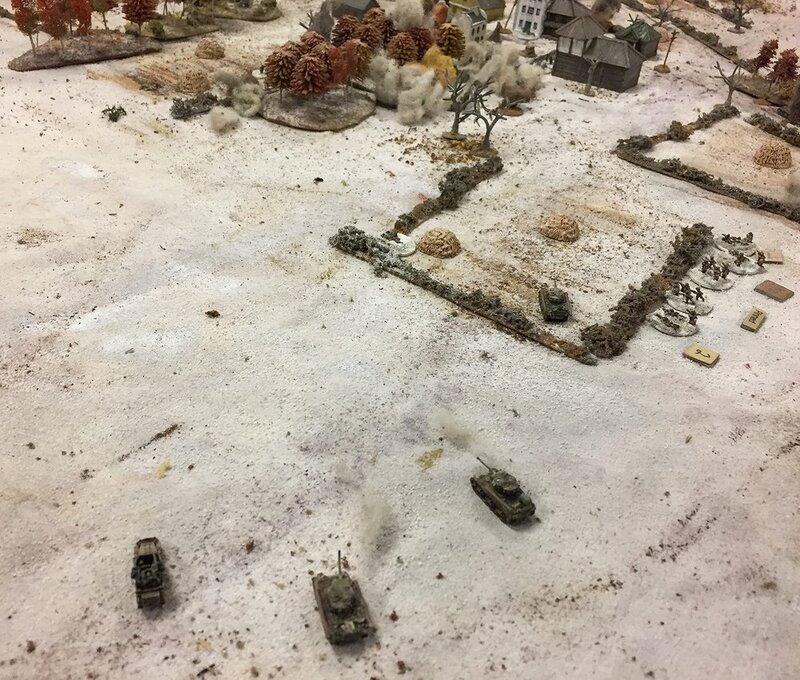 William held fire the first couple of phases, then opened up with his three tank destroyers. But the targets on the Russian left are only damaged. The third Jagdpanzer is seen in this pic. 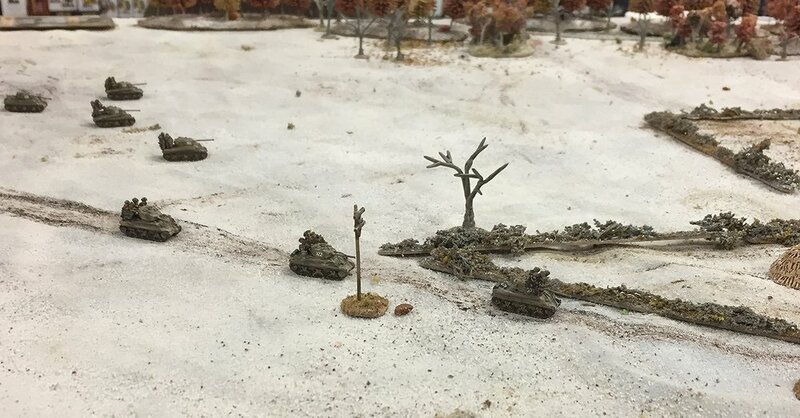 Tank riders scramble off their mounts. The lead section took very few casualties. 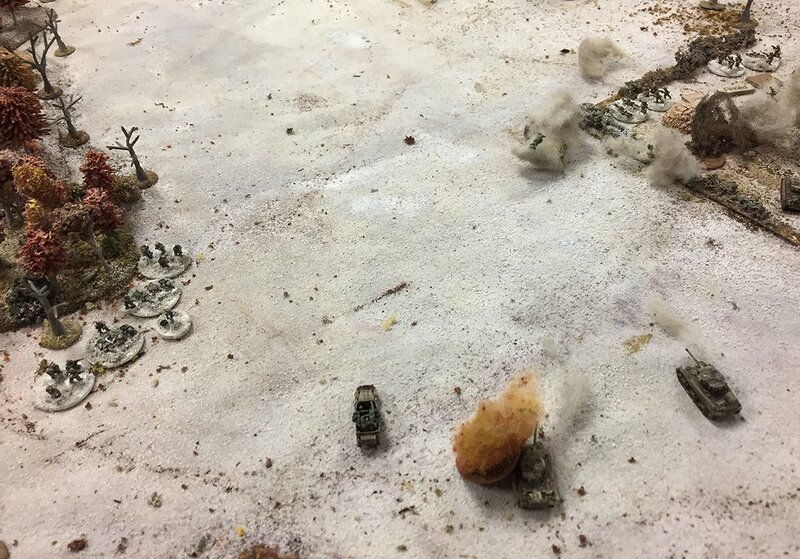 Another Sherman has its main gun knocked out of action. The card in the center is a German dummy Blind. I had the main Russian infantry force which came in three phases after the Shermans. I had a very weak company of two 2-section platoons, two MMG teams, two ATR teams and a panzerfaust . We also were able to call on some medium mortars. And if that wasn't enough we were to bring on an M16 quad .50 cal halftrack. My lead platoon is moving down the road under Blinds. The center jagdpanzer has also been put out of action by now. That's a dummy Blind out to the right. 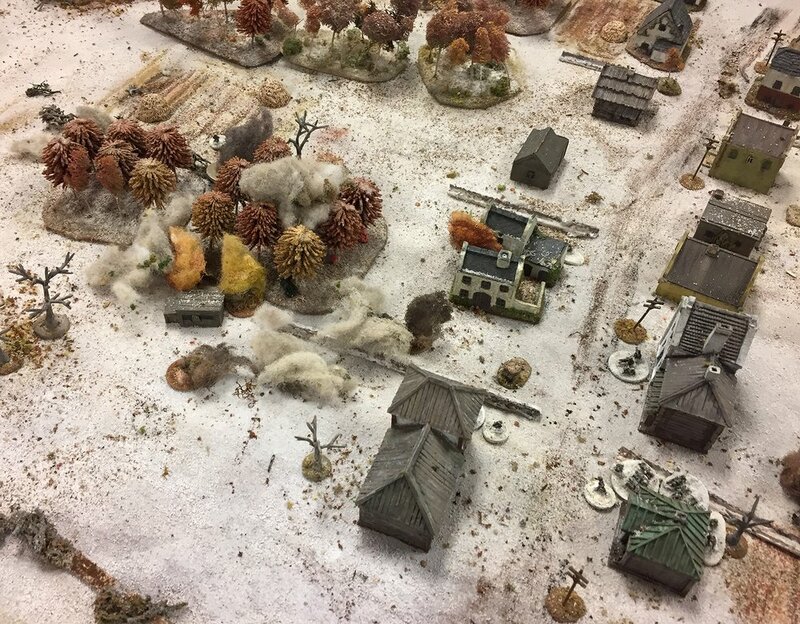 Two sections, an ATR team, a man with a panzerfaust, and the Platoon commander. Hard to see details, but they are in greatcoats...and have more character than GHQ but are less detailed than Adler. Company commander's tank in center near the road firing on the MMG back in the town. The rest of my infantry moves up. The infantry CO stops at the tank CO's vehicle. 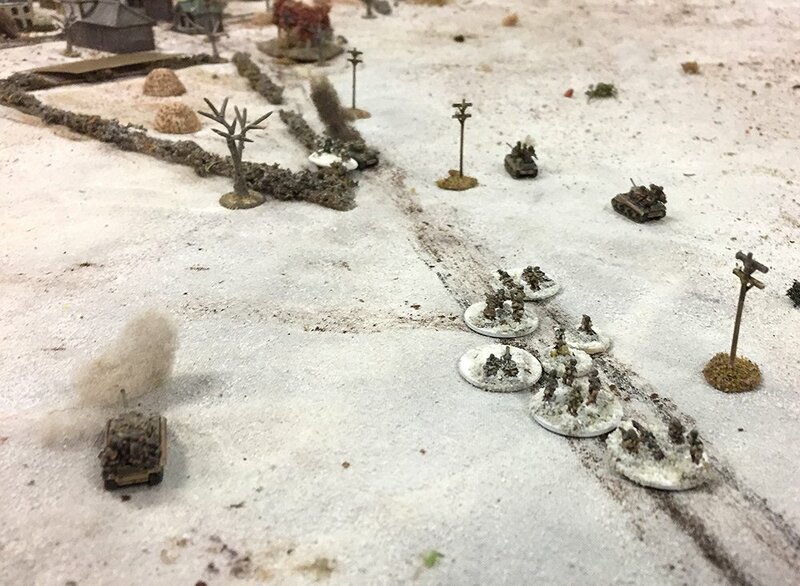 The third jagdpanzer has pulled back but the German MMG is doing a good job on the dismounted tank riders in the fields outside of town. 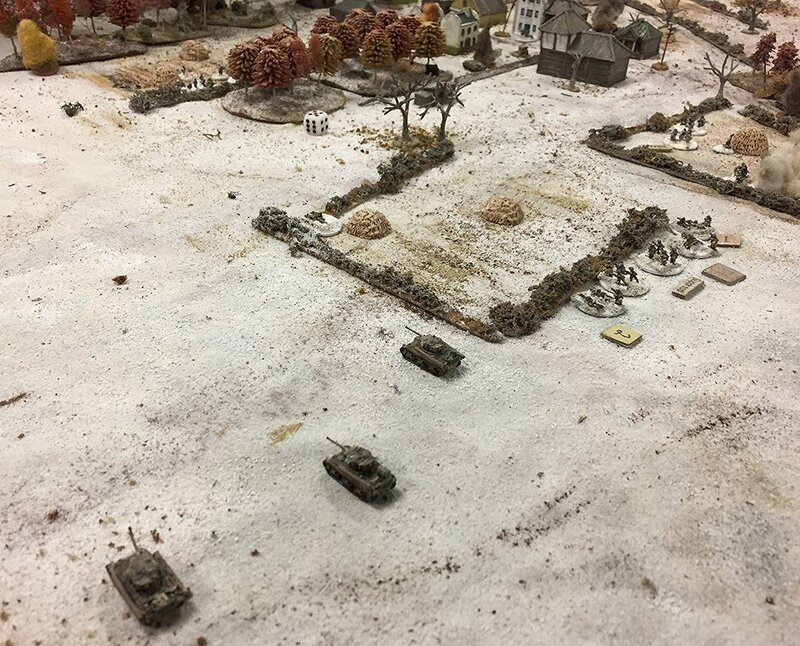 Matt's SMG teams have moved up to the hedges, and two Shermans move back to the main road. William had a panzerschreck team waiting. William is also busily tossing some mines about under the Blind. With his pioneers. Shermans are blasting the building but not killing the MG. The trees make their firing obstructed but not much foliage this time of year and the undergrowth is minimal this close to a town. They eliminate any threat from the SMG team in front of them. These are more H&R minis. Ordered to the rear to fight another day. The German shells are landing in the triangular field and a ranging round lands behind the grenadiers. 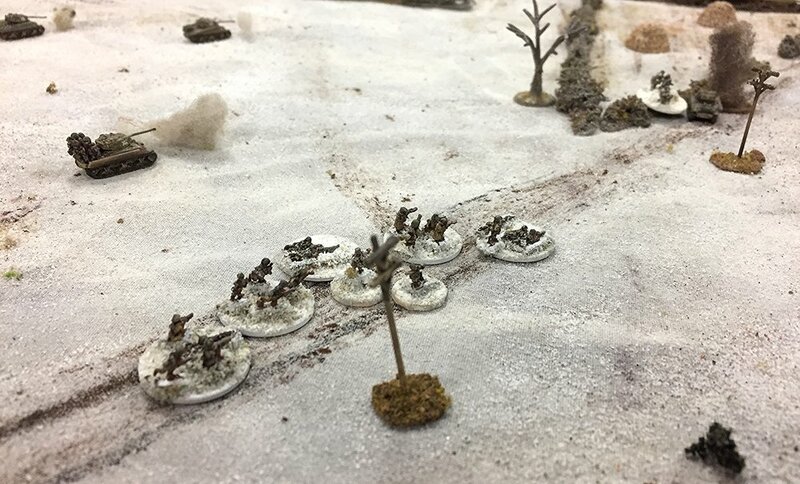 My left hand platoon is getting hit by MMGs from the town and now the grenadiers behind the trees. I have my Maxim engaging one of the German MGs. My CO is KIA but Matt's tank has no damage. 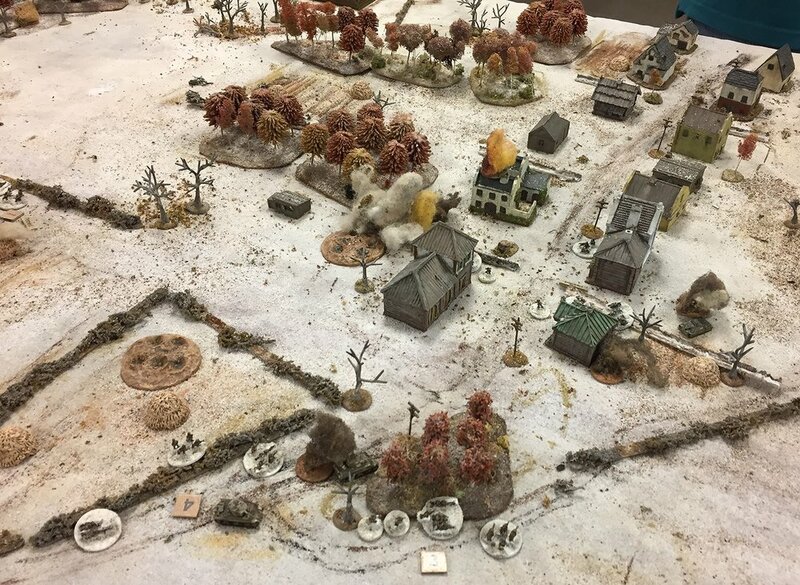 Hits the platoon behind the hedge and trees, and the grenadiers in the house . 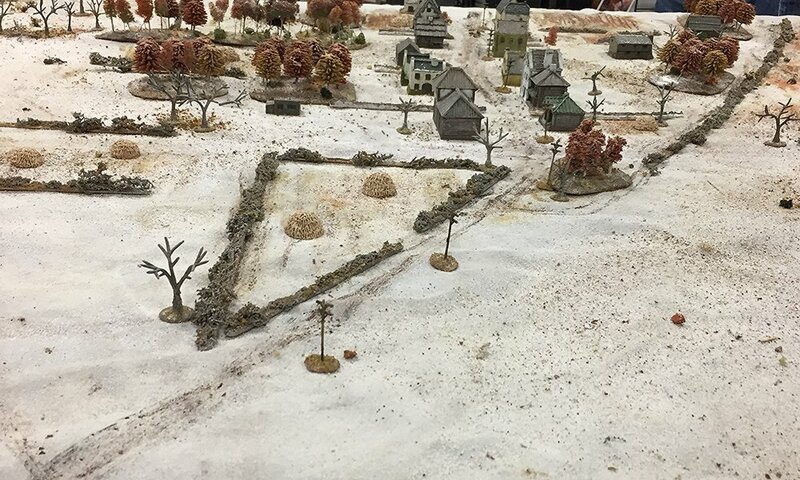 The other section of that platoon is in the green-roofed building. An MMG is firing from the building behind them. Eager to chew up some grenadiers. No planes have made it into the game so far. 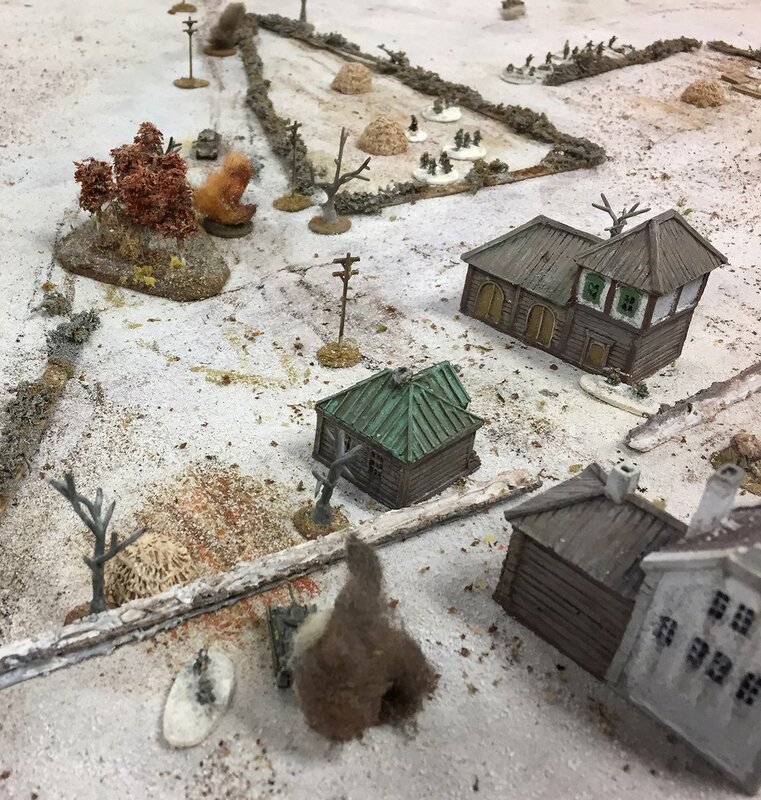 Panzerfaust takes out a Sherman but the M16 HT escapes damage from the small arms. Revenge will be sweet on that packed infantry target if the AA card comes up. A very bloody turn. 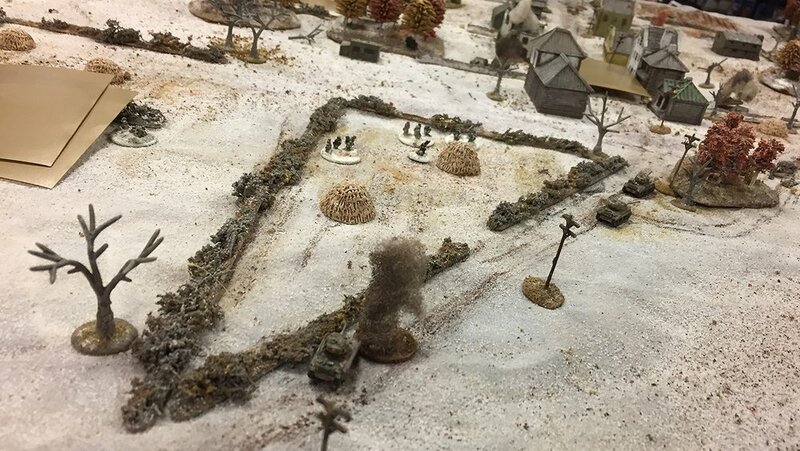 Mortars and small arms take out most ofJohn's center platoon behind the hedge. I put a panzerfaust rocket into the green roofed building. The third Sherman on the right is put out of action. I lose a platoon leader with my left platoon and the M16 drives men in the woods back to the river. It was a nasty fight. Two of three jagdpanzers gone. Four of seven Shermans KO'ed, and one has no main gun. John lost 23 of 48 grenadiers, an MMG section, a Company asst. Matt's SMG platoon lost 15 of 24 men. I lost 19 of 32 men, a platoon and company CO, and an ATR team. The pioneer zug got out without any losses. The Russians did not get into Ipolypaszto, so a German victory.